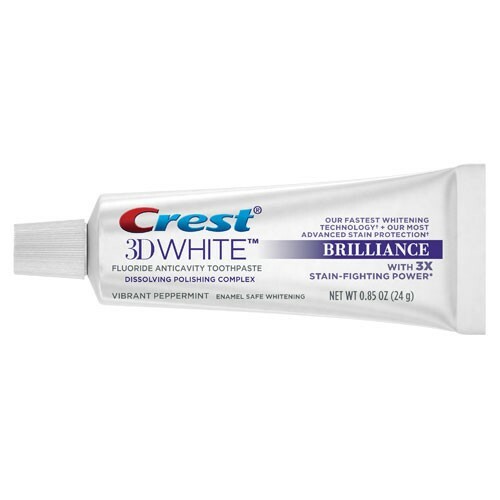 Crest® 3D White™ Brilliance Toothpaste is our fastest whitening toothpaste technology* and has our most advanced stain protection*. It removes up to 95% of surface stains in 3 days and protects against future stains. This enamel safe fluoride toothpaste helps prevent caries and strengthen enamel. Features: Our most advanced teeth whitening formula meets advanced freshness. See a whiter, dazzling smile. Illuminating Complex whitens by unlocking trapped surface stains. Micro-cleansing teeth whiteners polish away surface stains. Gentle foaming action to clean hard-to-reach places. Fluoride toothpaste to help prevent cavities. Enamel Safe.